FROM PLATO TO ŽIŽEK – CAN PHILOSOPHERS HELP US TODAY? Our relationship with the world is quite simply actualized through the concepts we form in our minds that enable us to speak about the reality we perceive. It is in this context that Plato’s allegory of the cave became one of the most famous philosophical metaphors in quotidian parlance. Our perception of reality is always filtered by our senses therefore it is not reality itself, but a subjective view of the object perceived. If that premise is accurate, each person perceives the world according to their own model achieved during the socialization process. Can we really know anything at all without the constraints of the dominant ideology mediating our experience? In a way, every ideology within a social system destroys the very essence of individuality and creates an illusion of a common good. Every thought or idea serving a higher purpose benefits the very structure on which the system was founded. If an individual, or group of individuals, questions the core beliefs that motivate that system, they will either be ignored or be eradicated for the sake of the system. We are all born into social groups that are culturally diverse. Countries are different from each other, and within a specific country there will be numerous regional and cultural differences with their own set of beliefs, their own ideology. The individuals learn how to conform to the ideology of the social structure in which they find themselves in, and perpetuate that set of beliefs in a cultural succession. The government, school, religion and family are the pillars of any given society. It’s through their united force and influence that society exists. We can rightly include the media in this list as an important vehicle used to reproduce wanted behaviors and support normative beliefs. An ideology only survives as long as it’s not questioned. Once it’s questioned the whole reason of its existence is broken into pieces and it’ll eventually cease to exist. There’s no inherent meaning to it. It’s empty. There’s a process of identification with an imagined meaning we all attach to the things and ideas within the historical context we live in. This association is quite automatic and our responses are therefore conditioned. We live as if in a dream of the reality we think we perceive, but truthfully we are simply reproducing the model represented by the chained individuals looking at the shadows in the darkness of Plato’s cave. It is difficult to break free from the operating ideologies that sustain the dominant system. It’s a constant exercise of disassociation from the copy of reality, the simulacrum. One individual might be aware and free from the power exercised by the ongoing ideology in a social expression, and still be completely entangled in other manifestations of that same ideology in other areas of the social landscape. We are social beings and we depend on the social organism for our survival, therefore, our behavior will somehow always be determined by different ideologies, one way or another. In Plato’s allegory of the cave human beings are chained by the hands, legs and neck and they can’t move or turn around. They face a big screen. Behind them there’s a suspended bridge or passageway. Behind this bridge there’s a large fire. On the bridge puppeteers hold objects that are thus projected on the screen. 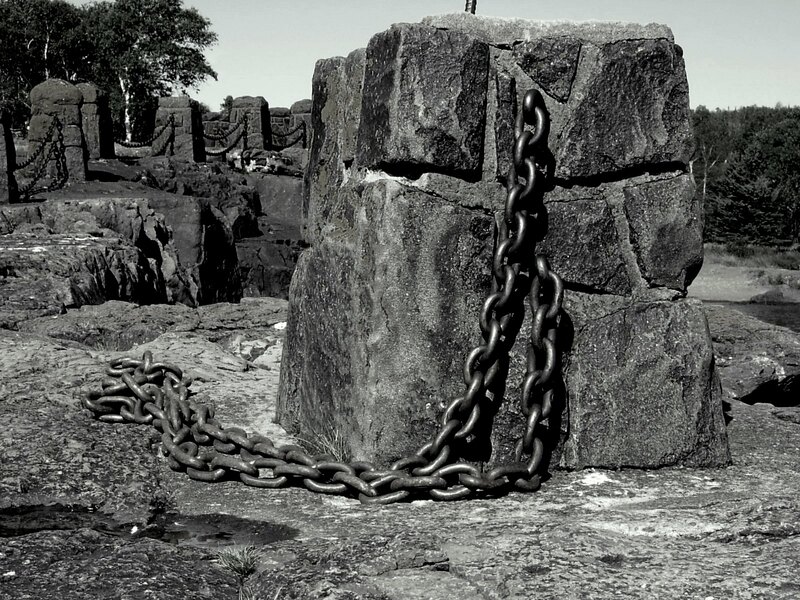 The helpless, chained men see the shadows projected on the screen and perceive them as real. At some point, one of them is set free and turns around and sees all that’s going on. He is taken outside by climbing the rough pathway leading out of the cave and is blinded by the daylight. Initially he can’t look at the sun because his eyes hurt. It’s all too bright and painful for now he sees. When he returns and tries to tell his companions about the truth he experienced, they all dismiss him calling him crazy and threatening him. In this allegory, Plato shows that the truth hurts and people are afraid to change their beliefs. 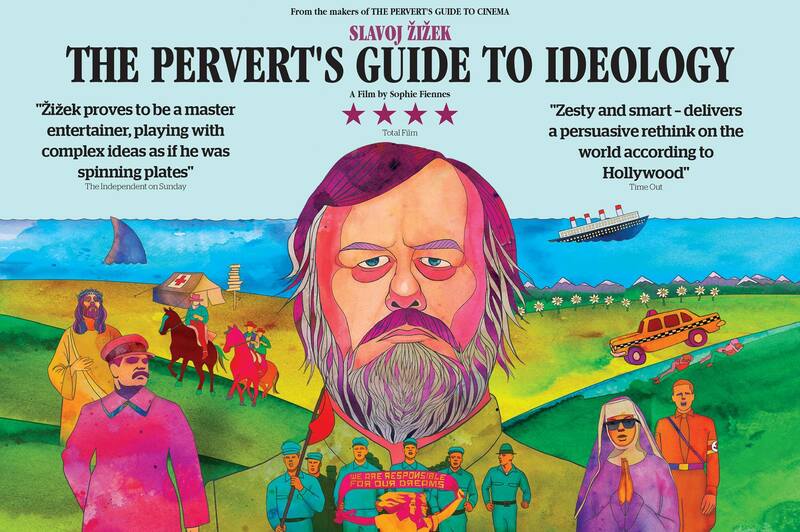 Slovene philosopher and psychoanalyst Slavoj Žižek joins film director Sophie Fiennes to create an explosion of intriguing philosophical analysis in the 2012 documentary “The Pervert’s Guide to Ideology”. 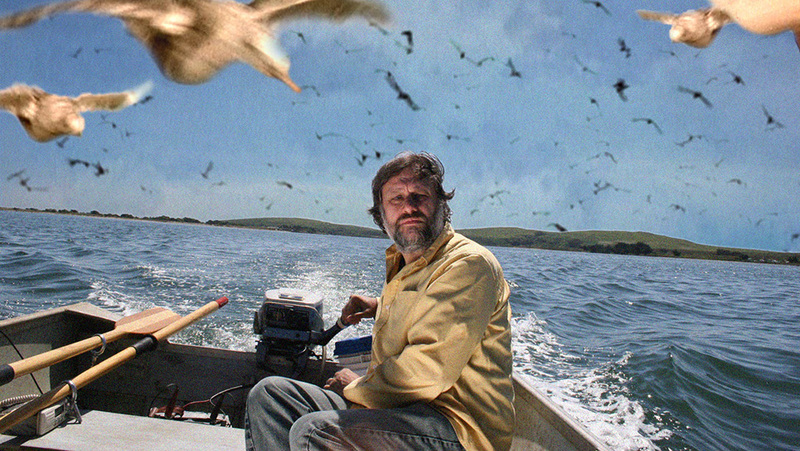 The center of Žižek’s arguments in the engaging documentary revolves around Plato’s cave. From this idea Žižek weaves his incessant philosophical discourse on the ideology behind every image and linguistic composition that serves the purpose of maintaining a social, political and economic structure developed by the operating government. Žižek makes use of movies to talk about the role of ideology in our lives and how it, surreptitiously, determines the way we behave within the social group. 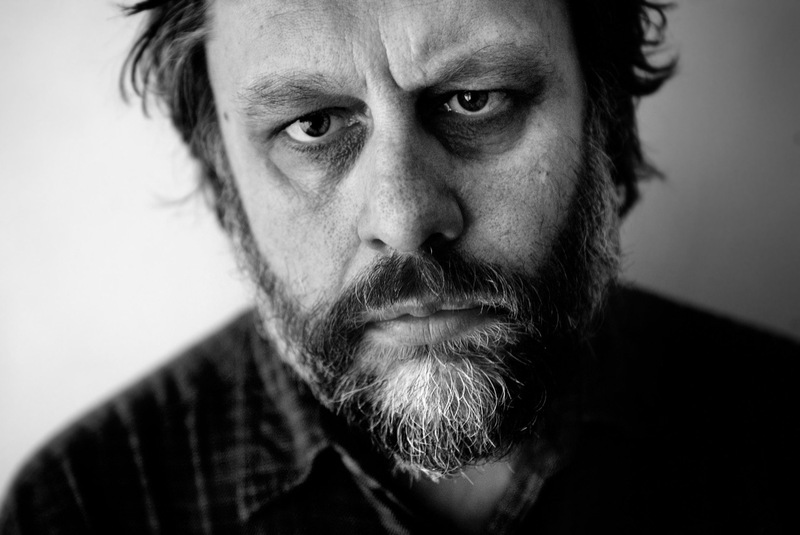 Žižek’s ideas billow towards us unrelentingly. He knows how to put forth his ideas without confusion. His voice and stocky figure comes in and out of reproductions of the movie sets as he muses over the different ideologies inserted into apparently simple scenes. This documentary follows “The Pervert’s Guide to Cinema” (2016), also directed by Sophie Fiennes and using the same format where Žižek analyzes the movies using an array of philosophical and psychoanalytical theories within the recreated movie sets. In “The Pervert’s Guide to Ideology”, the first movie examined under Žižek’s sharp lenses is John Carpenter’s “They Live” – a science fiction film made in 1988. The Slovene philosopher dissects Carpenter’s “politically subversive” film by introducing the ideas that will support his analysis for each movie he will discuss during the documentary. With the movie “They Live, we get the first glimpse into Plato’s allegory of the cave with the metaphor of the “ideology glasses” that the main character John Nada uses to unveil the truth behind the dominant message. Philosophy becomes as fascinating as Hollywood itself under Žižek’s guidance. He is funny and passionate about his subject, and even if a bit too authoritative at times, he still manages to seduce us with his arguments. His views on specific details on “The Sound of Music, “Taxi Driver, “Jaws” and “The Last Temptation of Christ” are quite gripping and leave a lot for us to think about. In “The Last Temptation of Christ” he goes on to affirm that what dies on the cross is God Himself, eliciting that the only way to true atheism is through Christianity. You may or may not agree with him in his philosophical approach but the fact is that this documentary holds your attention with a serious discourse, however odd and zany it might sound at first. We all agree that philosophers challenge people’s conventional opinions, but what role would a philosopher have in our convoluted times? 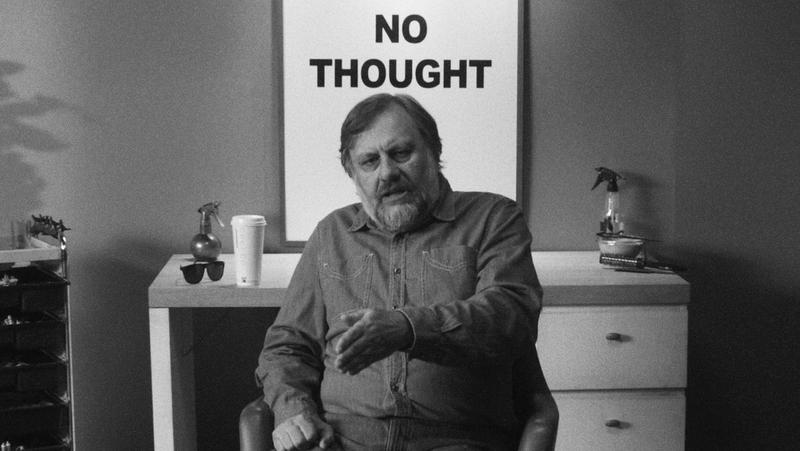 According to Žižek himself, the philosopher’s role is to help us ask the right questions. 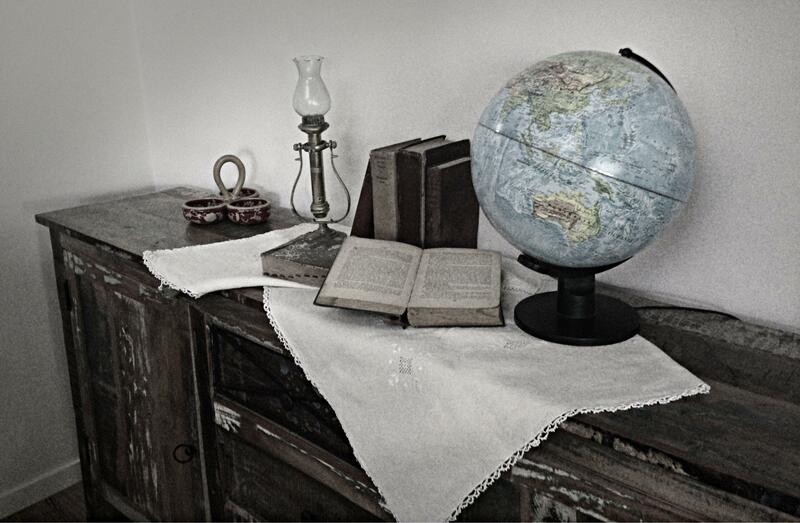 They certainly do not have the answers any more than we do, but they can help us to think. We are approaching a social crisis and we need to find ways that we can deal with the new problems we are faced today. It is fundamentally positive when we are challenged in our core beliefs because it is only when we let go of what we believe that we can transcend the idea and truly experience what is. Reality only exists outside language; only outside language the real can be manifested. Our experience of the Real will, therefore, take place in that space between one thought and another, between our need to be right and our willingness to understand.